Guys. This New York City summer is killing me. It is so humid, it makes the heat 100 times worse. This coming from a girl who grew up in Texas. But then again, I grew up in dry Texas where I got static shocked from door knobs and metal handles of all sorts. All. The. Time. I had this trick where before I would open a door or turn on a sink, I would wrap my sleeve around one of my hands and lightly tap the metal handle/knob/faucet in lightning quick speed as if I were a toad catching a fly. I'm not sure why I did it since it never prevented the shock, I guess it just lessened the unpleasant surprise. But I digress. It is humid here. Sometimes I get dolled up to go outside and I think to myself, "Summer, what is wrong with you? Why bother? Oh eff...your makeup is literally melting off your face..."
You know what's been helping me get through this season though (besides going to the beach)? Ice cream and sorbets and frozen yogurt and italian ices. Last weekend I went to Coney Island and had a lemon italian ice on the beach from a nice man pushing around a cart with a cute dinging bell. It was glorious. I have so many ideas in my head of frozen treats I want to make, I don't know if I'll have the time or stomach real estate to make them all. This ice cream is quite scoopable straight out of the freezer, but if you want it even softer, take it out and let it sit at room temperature for 5 minutes before serving. Do not replace the honey with regular sugar. You can substitute corn syrup if you wish. The reason is because honey is an inverted sugar that keeps the ice cream from forming large icy crystals thus making it softer easier to scoop. Yields about 1 quart with plum sauce leftover. Combine cream, sugar, and honey in a small saucepan over medium heat. Bring to a simmer, stirring frequently until the sugar has completely dissolved. Transfer to a sealed container and place in refrigerator for at least 4 hours until completely cool. 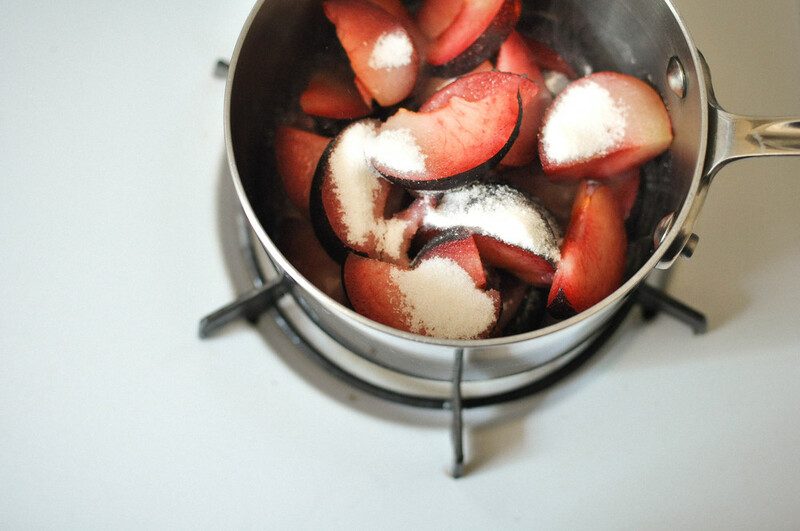 Place plums, sugar, and water in a small saucepan. 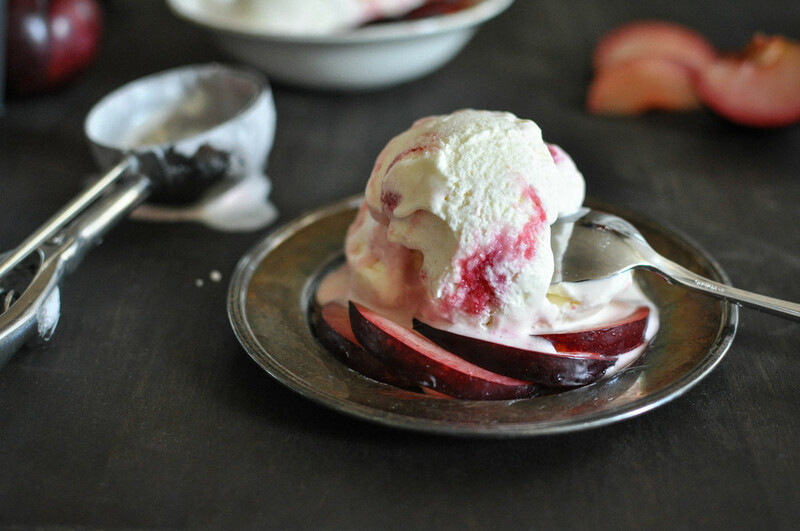 Bring to a simmer over medium heat and cook for about 8 minutes until plums are tender. Blend with an immersion blender (straight in the saucepan) until puréed. Turn down heat to medium low and keep simmering for another 15 to 20 minutes until sauce has thickened a bit. Strain through a fine mesh sieve, let cool to room temperature, transfer to a sealed container and refrigerate until completely chilled. Place a loaf pan in the freezer to chill. Add buttermilk to the chilled cream mixture and whisk thoroughly. 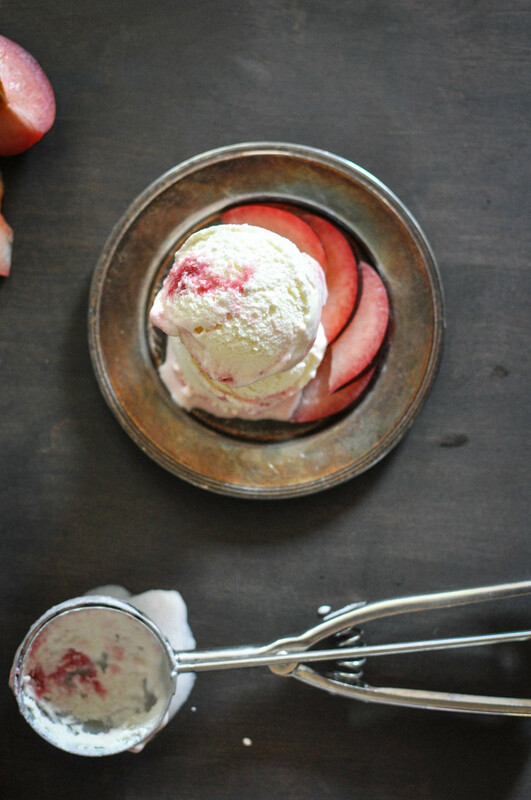 Churn the mixture in your ice cream maker according to manufacturer instructions. Transfer half of the ice cream to the chilled loaf pan and spread it out in one even layer. Drizzle about 1/2 cup plum sauce over it. 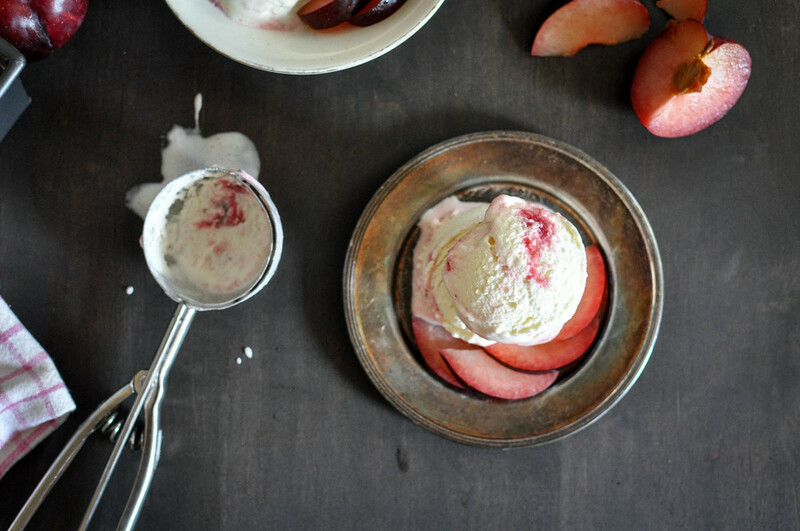 Top with the rest of the ice cream and drizzle another 1/2 cup plum sauce on top. Cover with foil and place in freezer to firm up overnight. Scoop and enjoy!